UK support to Pakistan’s national safety net initiative provides income support to those most in need. Noor Bhari, 54, lives in a small village in Hyderabad. The hut in which she lives has a damaged roof and houses 2 families with 11 children. Noor Bhari’s daughter-in-law Sakina also lives with her. “Before, there was nothing to eat, not even good water to drink,” says Sakina, whose husband struggles to find work as a field labourer. Now, the debit cards provided under Pakistan’s national Benazir Income Support Programme (BISP) have made it possible for them to buy food most days. 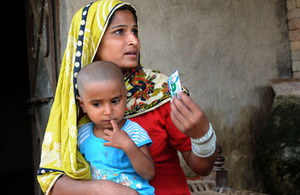 “The BISP card prevents us from going days without food. We manage to get the basic necessities and feed the children,” says Noor Bhari. 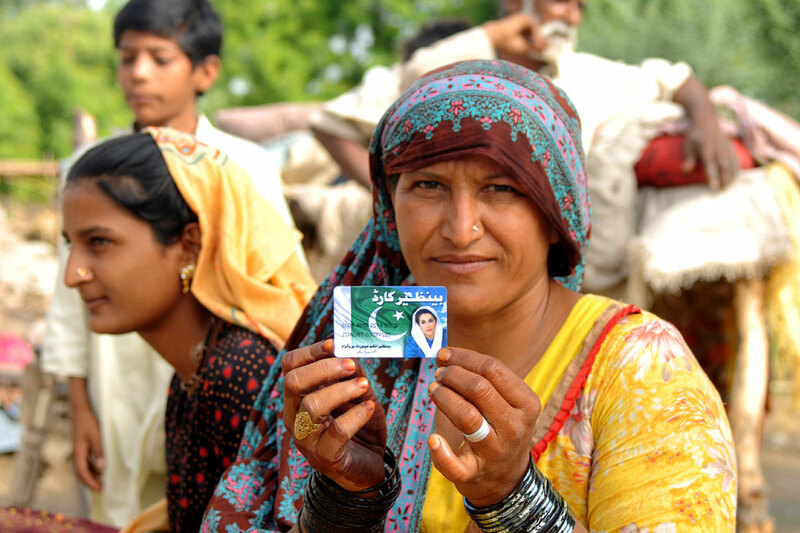 The UK supports BISP, which provides women in the poorest households small monthly cash grants of 1,000 rupees (approx. £7) to buy essentials, such as food and medicine, and to help send their children to school. Mothers receiving these grants can get an additional 1,200 rupees for each child (up to 3) in primary school. Last year UK support to BISP led to cash support for over 235,000 families across Pakistan, which could potentially increase to 441,000 families by 2020. The money helps address poverty, inequality, and lack of education, which if not addressed can lead to instability. BISP rolled out payments through debit cards to eligible families after a successful test phase last year. The “Benazir debit cards” ensure that beneficiaries receive payments directly and eliminate the need for intermediaries. Previously, beneficiaries received cash payments through Pakistan Post money orders. However, some of the recipient families were not receiving the full amount as certain mail carriers demanded bribes for delivering the money, says Hyderabad’s BISP director, Abdul Majeed Soomro. “We were hearing stories about postmen demanding partial payments, so the debit cards are a better way to ensure all the money efficiently and transparently reaches those who need it,” says Soomro. Currently 70% of beneficiaries receive payments through technology-based payments which has led to the gradual decrease of the Pakistan Post money order payments. BISP provides direct financial assistance to poor families through monthly cash payments to buy essential household items such as food and medicine, and to send children to school. A female representative of the family receives these cash transfers directly on the BISP debit card, helping them to participate in domestic decision-making. Payments are currently being made to 4.7 million families (benefiting 28.2 million individuals). The introduction of the BISP debit card has helped the cash payments reach the poorest and most vulnerable.